Write It Down: "Tales From the Barkside"
A massive apology for those were excited in viewing the second part of my blog post last year. This was scheduled for publication the following week, however due to personal reasons I was disillusioned in continuing it. I feel terrible for the late Chris Barat not having seen this entry, as he would have been fond of it. I regret not having commented as regularly on his blog, as I was shy in posting on his comment board. His comment on my last post "It seems that you got just as much, if not more, inspiration from the DUCKTALES version of Scrooge as you did from the classic comics version! That's what I like to see!" remains a catalyst in conveying my experiences. This goes out to you, Chris wherever you are. Now on with the post. 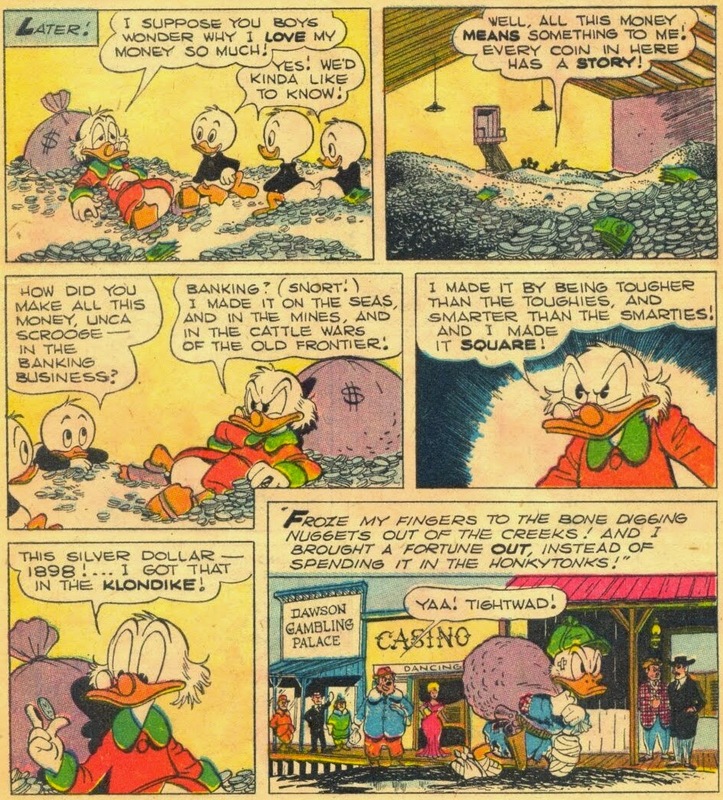 Scrooge McDuck leapt from the comic book pages onto the screen. Who was responsible for a rich creation? The answer to that question was solved, when I viewed the credits of Disney's "DUCKTALES". The name Carl Barks stirred interest. In addition, he wrote and illustrated comic books of Donald Duck and Uncle Scrooge. His wealth of stories and characters provided the template for the hit series. Many of his tales would for the basis for many episodes. At the time, I saw the oil paintings he did later in his career they had an elegance to them. 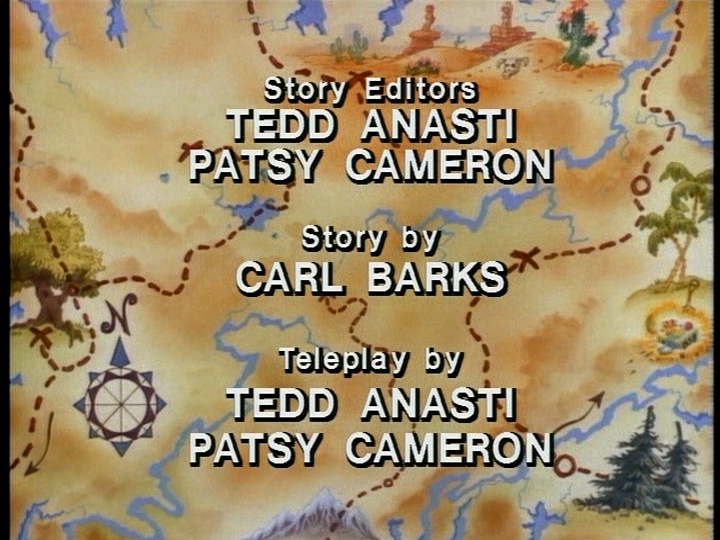 From the moment when I saw his name, I had an inkling that Carl Barks' stories were really good. One afternoon, while browsing at "Comic Kazi" a shop that sold graphic novels. In the corner I noticed a book with Donald Duck and his girlfriend Daisy Duck gliding on a skateboard. 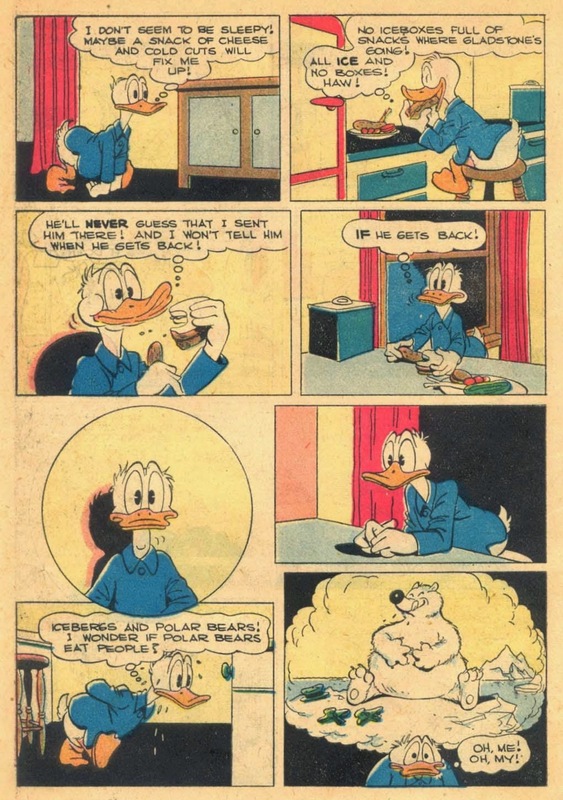 I quickly sampled the contents of the book, "The Biggest Big Walt Disney Comics". I was mesmerized by the multitude of comic book panels. On the way home I asked my father, if I could purchase the comic. He suggested that I save my allowance before purchasing it. I was adamant in owning that comic! I earned the money by doing chores around the house. I could not help but think of how it was reminiscent of a young Scrooge polishing a ditch diggers boots in order to receive his "Number One Dime". Uncle Scrooge in the corner was a factor that piqued my interest. The first comic I purchased. The actual comic is slightly dog-eared from having taken it everywhere. I recall lending it to my late friend Ian who also enjoyed the stories. "Luck Of The North" was one of his favorites. One Friday, I went with my father to "Comic Kazi" to buy it. When we arrived, I searched the shop but was unable to locate it. It was within that split second where I almost lost hope, then immediately I noticed the comic in the corner of the shop. I was beyond excitement when I handed the comic to my father for payment. On the way home my eyes were glued to the book. I had not seen the characters appear so expressive. With the exception of Flintheart Glomgold and Magic DeSpell most of Barks' creations were featured. 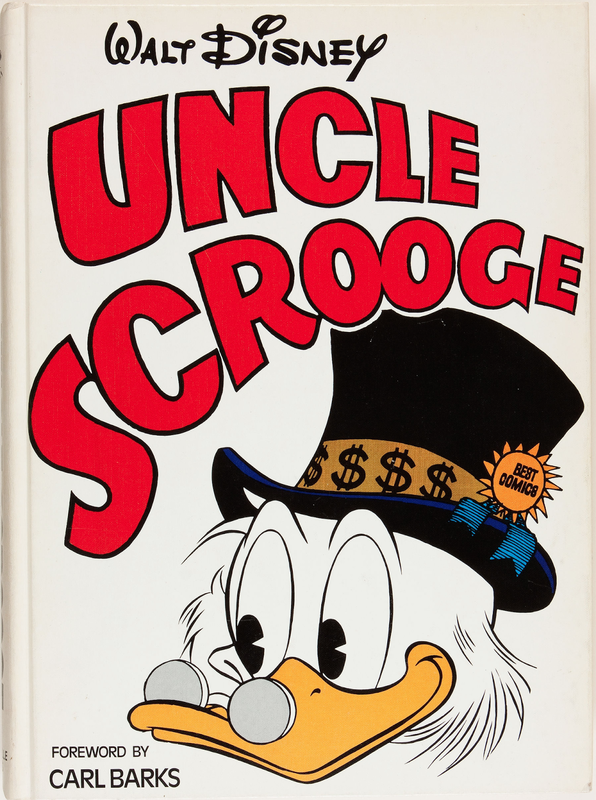 It was coincidental that the book reprinted the first "Uncle Scrooge" tale "Only A Poor Man". The opening panel showed him diving through his money bin, exclaiming: "I love to dive around in it like a porpoise, and burrow through it like a gopher, and let it hit me on the head!" I mentally heard Alan Young's voice as Scrooge bringing life to those words. I recall him uttering those very words in the episode "Don't Give Up The Ship". This was all the proof I needed to show how the series took inspiration from Barks' work. One of my favorite pages. In a previous post I discussed the impact Scrooge's expression: "I made it by being tougher than the toughies, and smarter than the smarties! And I made it square!" had. I savoured the glimpses into has past, as it made me see the character in three-dimensions. The lower right panel speaks to me. The scowl on his face as he hauls nuggets over the his back in the lower right panel, how muddy the ground is drawn, the cold expression from the locals adds to how desolate the period was for a young Scrooge. I recognised elements of the story that were incorporated into the DUCKTALES episode "Liquid Assets. I preferred seeing Donald in Fenton's role as I was familiar with him. I found the Beagle Boys attack on the dam where Scrooge stored his money very entertaining. How each side would respond with a counterstrike. The upper panel with his back towards his sun as he reflects on his past exploits features strong body language. Instantaneously his resoluteness has returned. The patience Scrooge has in contrast to Donald's anger is where there personality differs. His determination shines through when the chips are down. The confidence is craftily conveyed. Donald's irritated reaction was priceless. 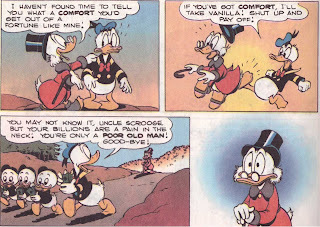 As I was not familiar with their dynamic, I found the upper right corner of Donald kicking Scrooge out of character. I preferred the story which the episode was based upon as the "coin-flict" was resolved. I understood in order for it to be a serial of episodes, the plot would have to be expanded. 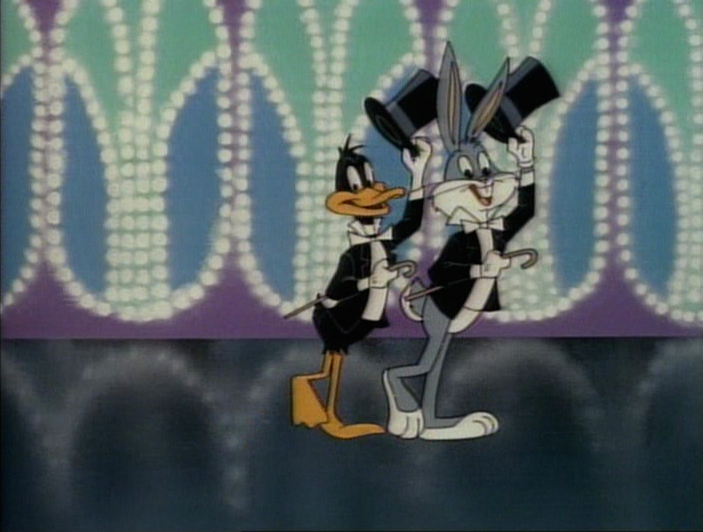 At the time my interest in the show wained by the intro-ducktion of Bubba Duck and Fenton Crackshell. I was irritated by how Fenton's ineptitude would cause a severe consequence for Scrooge. Overtime he has definitely grown on me. I understand his aspirations of wanting more of life instead of a standard job. Fenton like Donald has the right intent despite the inevitable back fire of there consequences. The book also contained "Luck Of The North". It was great seeing Donald's cousin Gladstone Gander as I had seen little of him in "DUCKTALES". (I am not sure if 'great' would be among Donald's adjectives in describing an encounter with his cousin.) What made me feel stranger about Gladstone was how having seen the episode "Dime Enough For Luck", was that he was a likeable character. Rob Paulsen did a great job voicing him, yet his voice never conveyed the boastfulness of the character. The worm in the lower corner illustrates the expression "feeling lower than a worm". It's an intricate detail but adds to the mood he is in. At one point in our lives or another we have come in contact with an individual who makes us feel small. I could relate to how disgusted Donald felt as Gladstone would easily won a fortune in a raffle. You could really sense the anguish he felt as indicated by the strong sickly expression on his face; or how he pummelled his fists in frustration on the pavement saying "I can't stand it! I can't! I can't". I could see the possibility at how well the later gesture would translate to a big screen. Donald creating a phony map to rid him away of Gladstone was ingenious. This was where I learned how lattitude and longitudes were useful in mapping coordinates. He turns off the light before sleeping. 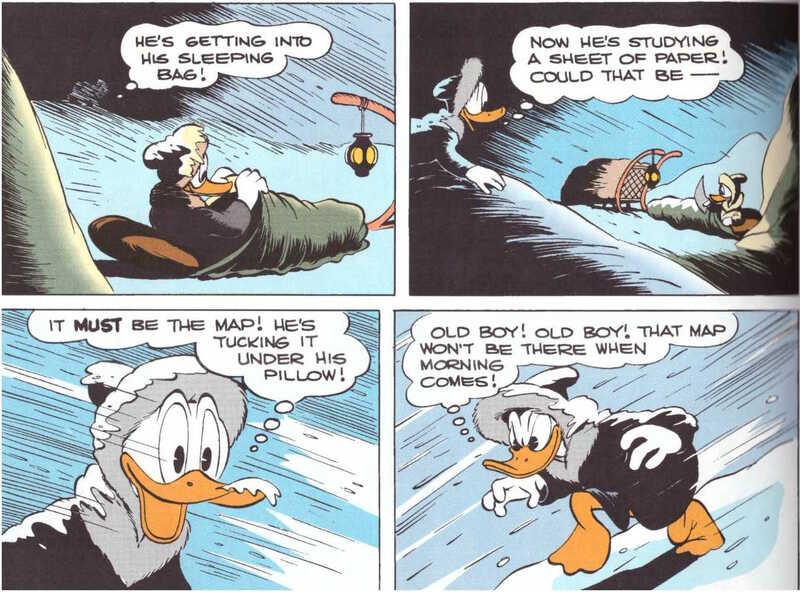 In the next panel he fluffs his pillow thinking " Guys can get stranded on those ice floes and drift for months! Have to live on fish!" He masks his guilt in the form of humor while he prevents the terrible thought of what happened to his cousin enter his mind. 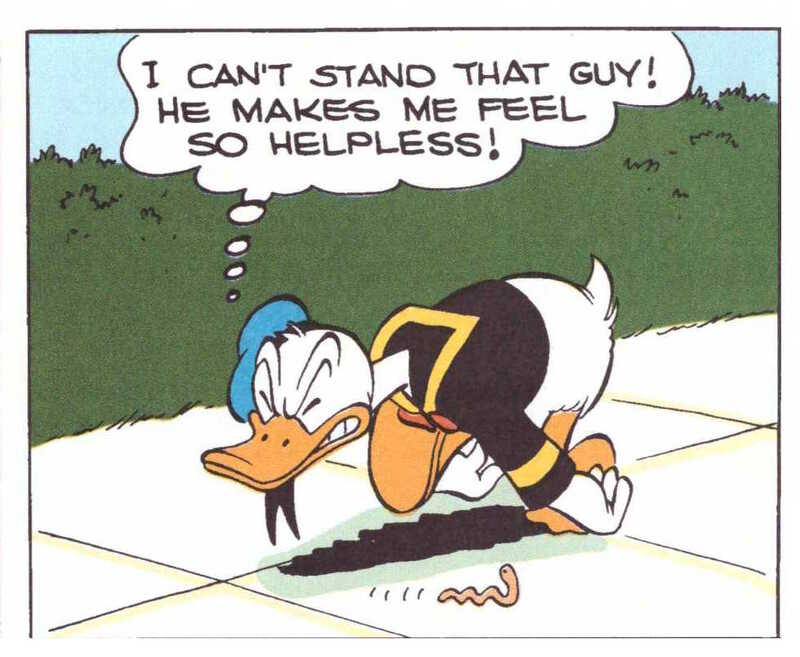 The sequence where Don's conscience plagues him was effectively done in the series of pantomime panels. The panel that is in a circle possibly shows a shift of mood. The bottom right corner, adds to how the consequence of his actions have a great weight on him. What follows is a wild goose gander chase in Alaska. 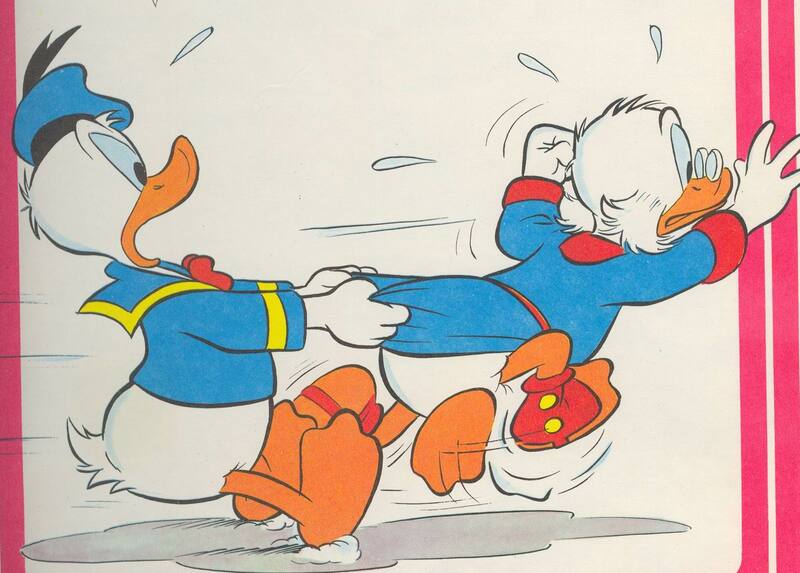 Whatever action Carl Barks drew, you felt as if you had experienced it. For example, when the Ducks are tracking him in the blizzard. The somber grey color of the skies, the dashes that would indicate it's snowing, and the non-stop sleet accumulating on the characters. It made me feel as if I were battling the brutal elements with them. I felt as if the snow was accumulating on my face and how bone-chilling cold it may have been. It was a completely sensual experience. Trust me, for those of you are curious how wild our winters can get in Calgary, Alberta this is the extent. When they stopped by the Eskimo Village, it seemed out of place how they interacted with humans instead of the funny-animals. The use of shading in the upper right corner adds to the bleakness. Look at how masterfully drawn Donald's stature is in the bottom right corner. I was struck by the immense grandeur of the iceberg in contrast to to kayak the Ducks were in. Beautifully drawn waves. Donald finally catches up with Gladstone and explains how the map was a ruse to get him lost. A kerfuffle ensues between the both of them, which results in one of the kayaks to sink. The remaining kayak is one with four seats and as there are five occupants; they flip a coin in order to decide who will stay. Gladstone is the one who wins. Donald offers that the boys will join him; instead they stay behind. I appreciated how loyal the nephews were in staying with their uncle. As Gladstone leaves, he comments "I was never one to mix in family arguments!" while watching Donald chasing his nephews. I was curious as to how relations were in his family. Outrage was felt as Donald once again pummelled his fists in agony, while Gladstone stripped away the gold from the Viking ship. The streak of hardship they suffered after Donald rescuing his cousin, made the ending of the Ducks discovering the ancient Norse map worthwhile. Every evening on Teletoon, viewing the opening of THE BUGS BUNNY & TWEETY SHOW signaled a magical time started by Bugs and Daffy clad in tuxedos marching onto a proscenium with their stable of Warner Bros. players . I was watching television on the green sofa when my sister asked me to close my eyes, as she presented this book in my hand. It was a glorious moment when I opened my eyes to see the picture of Scrooge on the cover. The foreward by Carl Barks was informative as it included a picture of him behind his desk. It was reassuring seeing the man whose backlog of Duck stories I had come to appreciate. I extremely enjoyed the stories reprinted in "The Biggest Big Walt Disney's Comics. A few months later my sister had borrowed the Uncle Scrooge book from the library. 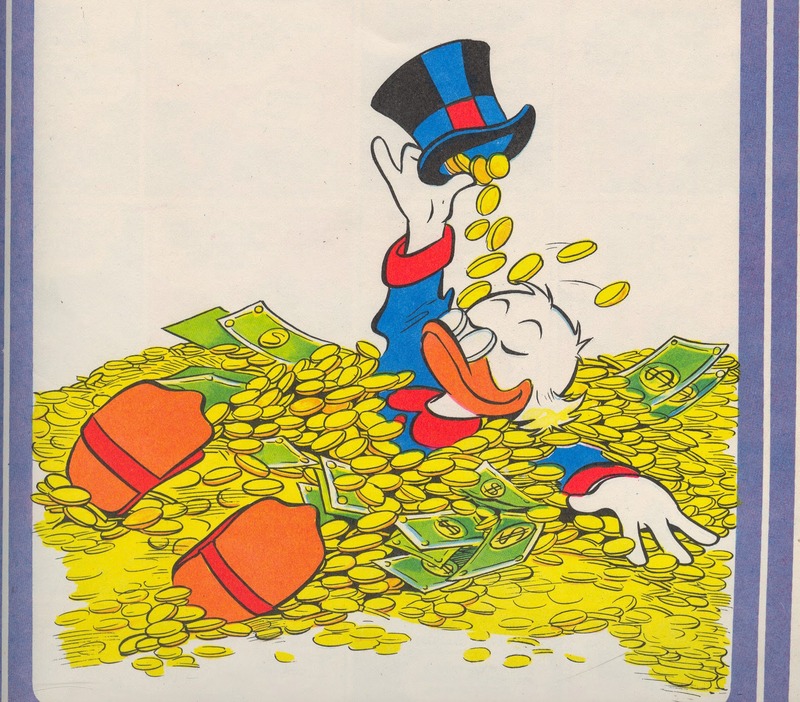 I hungrily devoured the contents of the Abeville's treasury of Uncle Scrooge tales. I appreciated how the colouring of his coat corresponded to the one he wore on the series. I cherished how before each story, there was a vignette, that would reprint a character's pose from a panel. I took on the role as an inking girl, who would go over the animator's drawing. It was fun deciding which colours would best suit the drawing. Eventually I would "duck-orate" my room with these sketches. An example of the illustration that appeared before "North Of The Yukon". It was a good introduction of how Carl Barks would draw his expressions. The eleven year old me was attracted to the foreboding atmosphere as the Ducks visited the haunted castle McDuck, when they went to Goldopolis, Nevada to search for a railroad share in a ghost town. Excitement raced through my veins when the Ducks were sabotaging the rival rockets in finding the elusive twenty-four-carrot moon (With some tinkering it would have made for an episode of DUCKTALES) or when they were competing against Gladstone in finding a golden nugget. I was capitivated when Magica DeSpell commanded meteors from the sky in order to destruct Uncle Scrooge’s money bin. There was a sense of weight to his drawing of the sinister sorceress. You would be immersed in whatever mood he set for the story. At that age, many the times, I felt excluded on account of my age from many activities. 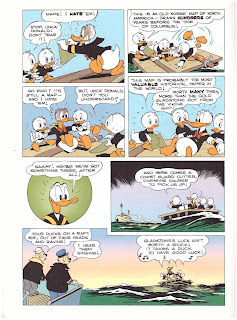 In “Pipeline To Danger”, I could identify with what Hewy, Dewy, and Louie felt when their enthusiasm to be a “Big Operator” like their Uncle Scrooge was rejected. It was a morale booster for me when they would use the “Junior Woodchuck Guidebook” in order to assist their uncle’s. What I gravitated to in Carl Barks’ artwork was how many of his panels were realistic of situations we find ourselves in. I have had tendency to recall a panel from his work when thinking about a moment in my life. Having been weaned on DUCKTALES there were some peculiarities in his stories, among them: In the stories The Beagle Boys had distinct personalities, whereas in the comics they were clones. I mentally heard the voice actors on the show perform their respective characters. It was jarring to discover that Magica DeSpell lived on the Mount Vesuvius, as on the series she spoke with an Eastern European accent courtesy of June Foray. In “McDuck Of Arabia” seeing Donald in Launchpad’s role when he was flying Uncle Scrooge’s jet plane to look for Huey and the kidnapped Sheik. 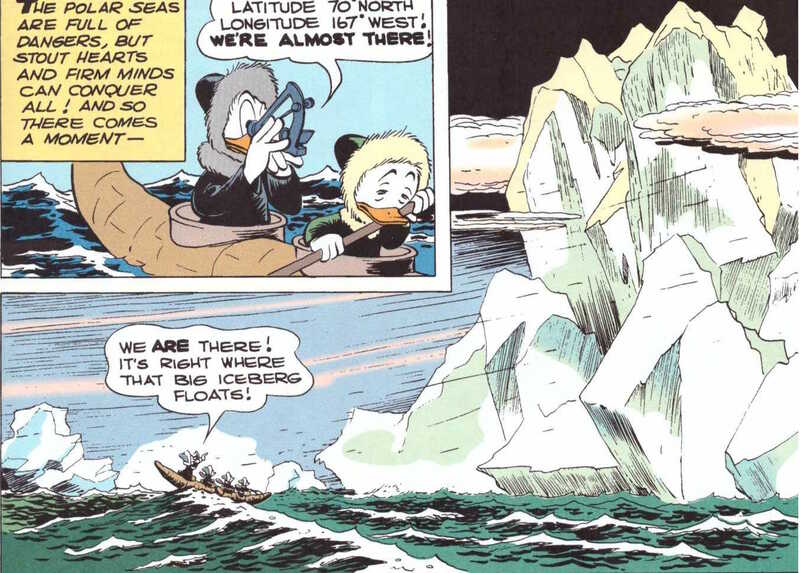 I was astonished how Flintheart Glomgold was to have been from South Africa. It was a coincidence that among the stories reprinted: “The Giant Robot Robbers”, “The Status Seekers”, and “The Unsafe Safe” were adapted as episodes of DUCKTALES. I was astounded by how there was more proof of how the comics were the basis for the series. It was interesting to mentally note what changes the writer’s may have made in order to adapt it. 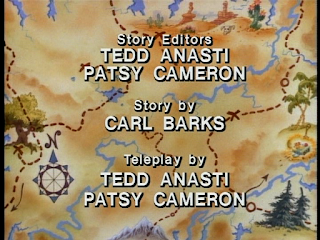 For the most part the episodes that were based on the stories reprinted here did not veer too much from Barks’ material. 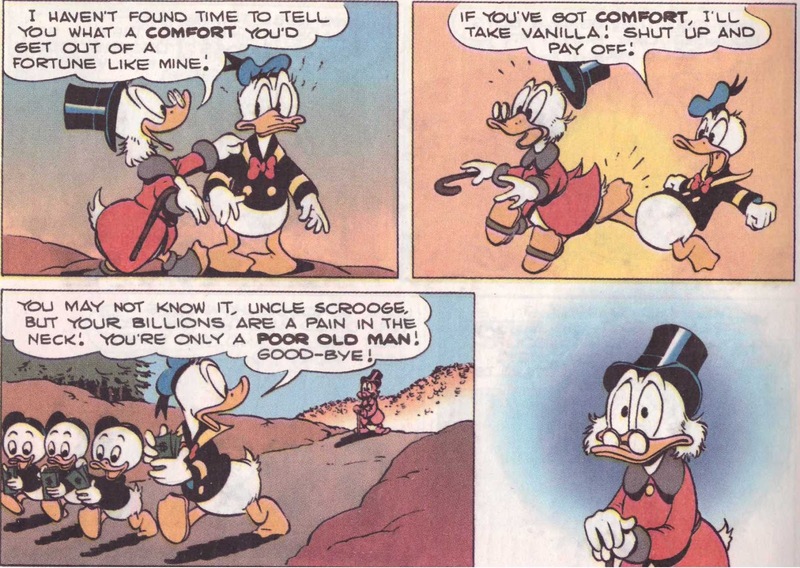 It was an immense introduction to the Uncle Scrooge tales that I reveled in. Nowhere else could I have read tales that satiated my sense of adventure, mystery, and most of all FUN. It was a Barks dry spell when I had to return the book to the library. In the following months I borrowed Goscinny and Uderzo’s “Asterix” magazines from the library. As Duckburg was complete with diverse denizens to round out Donald’s world. The village of Gaul was fleshed out with many secondary characters from the leader Chief Vitalstatistix, Fulliatomatix the village smith, and Unhygenix the fishmonger. How I howled when a fight would ensue between Fulliatomatix and Unhygenix often due to the stale stench of his fish. Uderzo when he sketched Obelix pulverizing the Romans to a pulp had a great realistic style. The sound effects “Biff”, “Baff”, and “Pow” echoed the power of his punch. Translators Derek Hockridge and Anthea Bell did a stellar job of localizing the dialogue. The mirth-enducing names of the one- note characters they devised were clever. Thank you for the dedication to Chris Barat! I often find myself wishing he could read a new Blog post of mine – and especially see the new IDW Disney comics. He would have loved them! I am forever fascinated at how different individuals “find their way to this stuff”. I can certainly see how that “Donald and Daisy Skateboard and Umbrella” cover would attract you, as it was one of my favorite WDC&S covers of the mid-sixties era from which it originated! Carl Barks had (to me, at least) a particularly pleasing art style at the time. Not his classic, 1952-era style, but something I really liked. Oh, and I hope Canada’s BUGS BUNNY AND TWEETY SHOW’s cartoons were less chopped-up than the ABC Network version we had in the States. Those were cut to a ridiculous extent, to where I could no longer watch them. So glad we have the DVDs today! Hey Joe! Chris was one of the good ones, how could I not think about him while writing this. 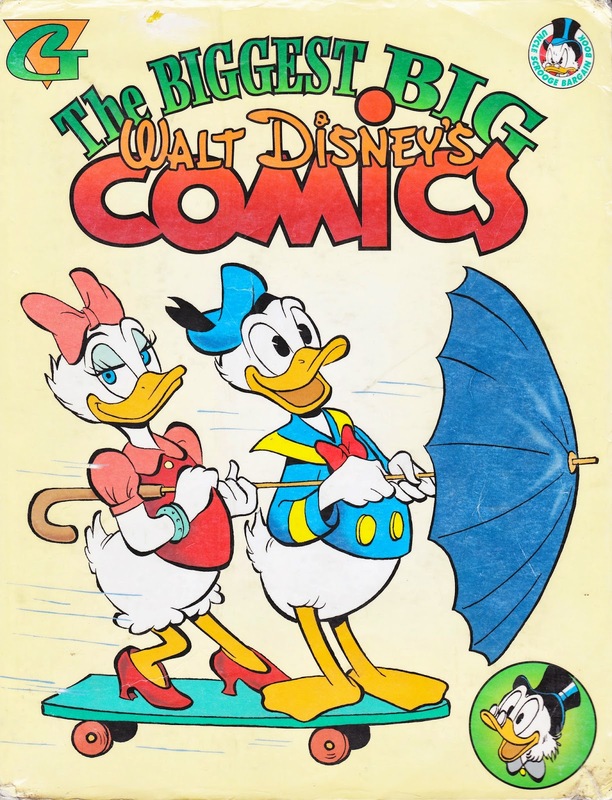 The "Donald and Daisy Umbrella" cover is the most memorable of his covers. 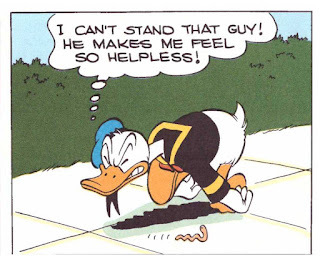 Oddly, it is hard for me to chose a favorite art style of Carl Barks' as I like it all. Canada's BUGS AND TWEETY SHOW were the same ones that aired in the states. It puzzled me to view cartoons that I had seen unedited on VHS were butchered. It IS indeed, difficult to choose a favorite Barks art style, because he had at least THREE separate and distinct art styles: His ‘40s style which evolved from “sort of primitive” to the wonderful “Ghost of the Grotto” style, his ultra-classic style circa 1952, and his sixties style. A really funny thing is that I bought that BEST OF UNCLE SCROOGE AND DONALD DUCK collection that included “Back to the Klondike” and “Ghost of the Grotto” in the same incredible issue, new off the newsstand in 1966. At the time, I failed to realize that it was the SAME ARTIST on both! 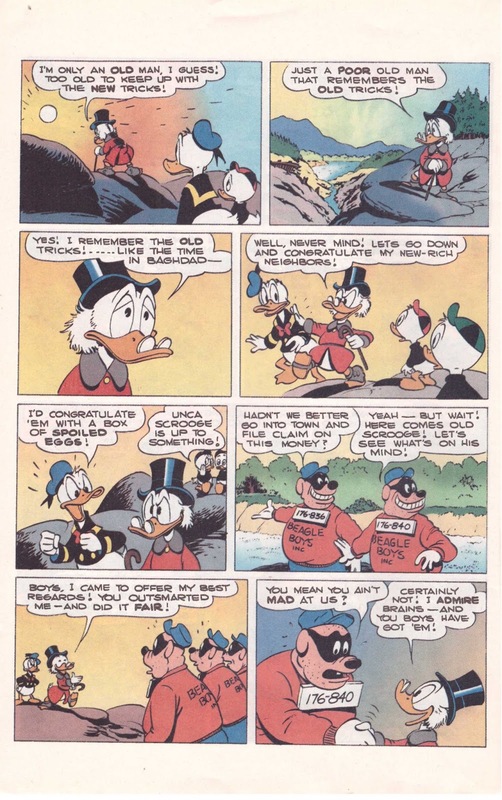 …And, further failed to note that it was ALSO THE SAME ARTIST who was currently working on UNCLE SCROOGE! Imagine that! Also consider that TWO great later artists specialized in different aspects of the evolving “Barks look”! Vicar did the “circa 1952”, and Daniel Branca did the sixties look. Lately, Daan Jippes is also doing a really lively hybrid of late ‘50s thru sixties, as well.